If logic and perfect information ruled the world, no setback would be permitted to disgrace a plan by making it wrong. But “The Plan” is just a plan. We still have to climb the mountain or hike the pass or whatever we do and see how it goes. And just like any other complex, uncertain event, a mountain adventure is filled with stuff going wrong despite sincere efforts to ensure it goes right. 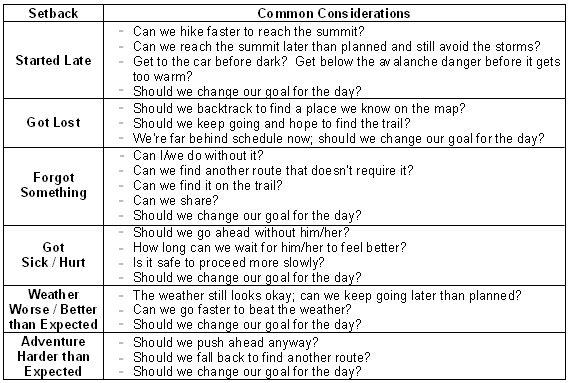 A critically important part of any high peaks adventure is dealing with new information (called a “setback”) that requires changes to “The Plan.” Making decisions “on the trail” is the most difficult step in the risk management process, as we are: (1) under constant time pressure, (2) dealing with many variables and significant uncertainty, and (3) susceptible to many decision-making traps, biases & fallacies. But we must deal with setback when they occur so that we can recalibrate our focus on safe success. We use a structured approach to help us to assess the impact of new information and make changes to the plan quickly and safely. 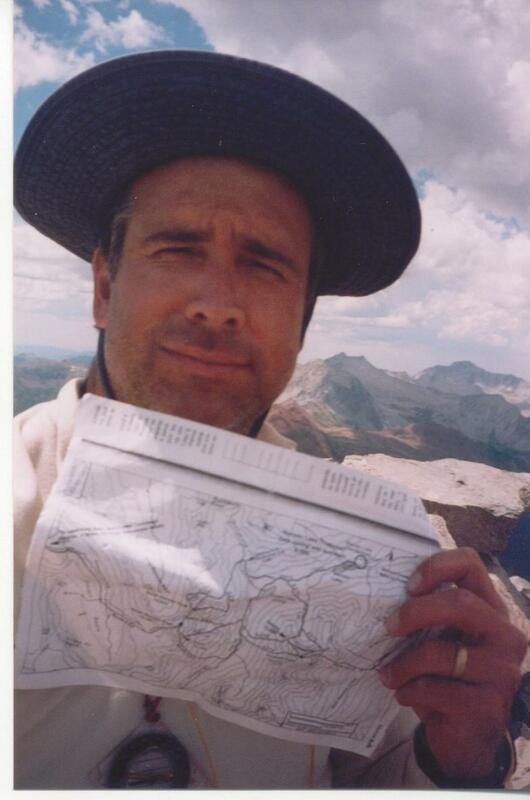 Dealing with setbacks is a part of the challenge of the high peaks. Generally, the setbacks that occur are of a common variety and undoubtedly have happened throughout time immemorial. To “yield and overcome,” we prepare a plan beforehand to reduce uncertainty and then we deal responsibly with the inevitable setbacks that arise while on the mountain. 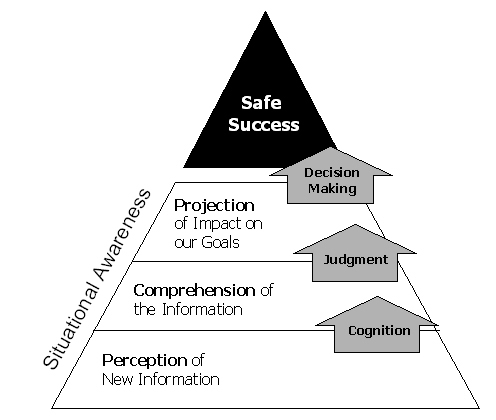 In the face of setbacks, safe success means maintaining the mental balance between “the spirit to push on when possible and the wisdom to go home when necessary,” and doing two things well: (1) maintain situational awareness and (2) make quality decisions to incorporate the new information into our efforts for safe success. Making quality decisions to overcome setbacks despite the complexity involved and our habitual use of inappropriate decision-making short-cuts. “The Plan” is just a plan. No one dreams of sitting around the campfire telling stories about the great planning efforts of yesteryear. We still have to do it, and, inevitably, stuff is going to go wrong. We don’t build “The Plan” because we believe the adventure will play out exactly as planned. It is because we expect setbacks and mishaps that we build a plan to provide practice, memory building, problem anticipating, and learning setup. We constantly monitor the situation to capture new information, and then we use a structured approach to deal with them competently and quickly to preserve a chance to safely reach the goal. Playing in the high peaks is a great way to have fun and rewarding memories; but we need to keep it in perspective. To “yield and overcome” means to respect danger. Never to take for yourself or encourage others to take what feels like a big chance on being injured or killed. Never put yourself or anyone in your team (or outside of your team) into a position of having to be a hero for everyone to survive. Living by luck and fighting the mountain are not the way to reach a thousand days atop the high peaks. Follow the “yield and overcome” mindset; take what the mountain will give you, and reach a thousand days atop the high peaks, or more.